Ross Irwin in action on the Slemish Water Kawasaki at Mondello Park. Picture: Pacemaker Press. 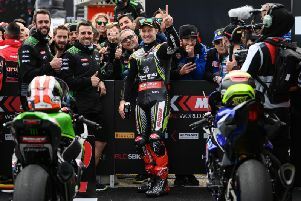 Ross Irwin celebrated his first Irish short circuit victories with a double in the Supertwins class at the opening round of the Dunlop Masters at Mondello Park on Sunday. Riding the Slemish Water Kawasaki, Irwin – who is the eldest of the famous racing Irwin family from Carrickfergus – clinched a double at the Co. Kildare circuit. He won the first race by over four seconds from Vinny Brennan and followed up in race two, edging a narrow win by only 0.112s from David Halligan. On Saturday, the Northern Ireland rider claimed a podium in the opening Supertwin race of the weekend in third place. Irwin only made his racing debut last September. 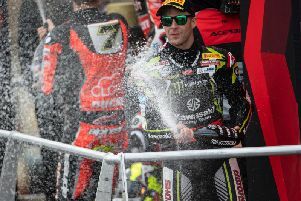 His brothers Glenn and Andrew are competing in the British Superbike Championship this year for the Quattro Plant Kawasaki and Honda Racing teams respectively, while former British motocross champion Graeme will make his debut in the National Superstock 1000 series for Team 109 Kawasaki. Richie Ryan won all three Masters Superbike races at Mondello, with Luke Johnston twice finishing as the runner-up. Peter Moloney claimed second place in the third race. Caolan Irwin was in a class of his own as he ran away with the Supersport races, rattling off a treble to establish an early lead in the championship.